Watching a video is much easier. There is a series from CCTV or Beijing TV which is quite nice. Every time the Beijing host invites a new cook or a new guest and they do one or two recipes. It is great to listen to the beautiful Beijing accents and see a dish develop. This dish is inspired by their video of fried eggplant strips. Start by cutting the eggplant into chunks about 7 cms long. You might cut the eggplant into 3 to get equal size chunks. Cut the chunks into half and then into strips – don’t make them too thin, just a little bit fatter than finger size. Put them in a bowl of salted water. After 10 or 15 minutes, take out the eggplant strips and squeeze them dry. Then coat all over in cornstarch and put aside. 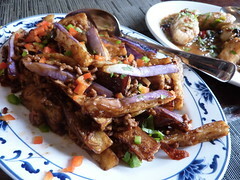 Fry the eggplant strips in a wok with hot oil until they are golden brown and crispy. Drain on kitchen paper. After frying the eggplant strips, take out the oil (if there is any left) and leave 3 tablespoons. Fry about 100 grams of minced meat. Add soy sauce, Shaoxing rice wine, sugar, salt, chopped up garlic and ginger cut into strips to get a nice mixture. Add a little water to make a sauce, then return the eggplant strips to the pan. Coat all eggplant strips with the sauce, stirring and turning, and add small chopped dice of red and green bell pepper for color (if desired). The eggplant will be very crispy, but not too oily because of the cornstarch crust. Great dish for the Chinese repertoire! I have made this before and it was very nice, but i guessed how much of the ingredients to add, when do you add the sweet bean paste and how much.